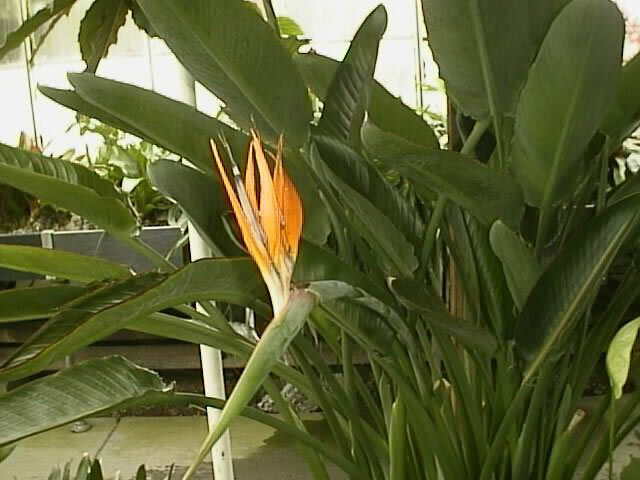 The Bird of Paradise (Strelitzia reginae) grows best when it receives a minimum of four hours of direct sunlight a day, but they should have bright light all day. Daytime temperatures of 68°-72° and night temperatures of 50° to 55° are optimal. Strelitzia flower more readily when they are somewhat rootbound, which is why they are often grown in large pots or tubs. 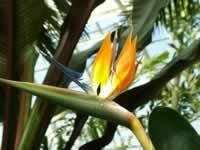 Plant your Bird of Paradise in a mixture of sterile potting soil, peat moss, and sand with a liberal amount of bone meal added. Good drainage is essential. Keep the soil evenly moist except from November-February when your plant should be kept on the dry side. Feed every two weeks from March through September with a balanced (10-10-10) fertilizer. Dividing your Bird of Paradise will be easy once you have removed it from the pot. The roots are very thick and fleshy, so be careful, but don't be nervous, these plants are pretty tough. then carefully cut between the two plant sections with a CLEAN, sharp knife. It is a good idea to dust the fresh cuts with a rooting hormone, such as 'Roottone'. Cut off any of the roots that may have been badly damaged during the operation. Repot each section in a sterile pot, using a good commercial potting soil. Keep in mind that Bird of Paradise plants bloom best when they are rootbound, so keep the new pot size as small as is feasible. Give your Bird of Paradise a shot of all purpose fertilizer next spring, and watch them grow! Your Strelitzias should be blooming again in the following year. It doesn't matter which side of the seed is "up". depending on the soil temperature and freshness of the seeds, so be patient. Bird of Paradise plants grown from seed can take seven years before producing their first bloom!